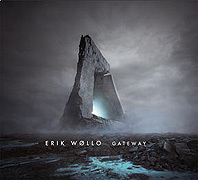 On Gateway (70'16") Erik Wøllo continues to explore his musical imagination. Through many years of experience he has gained knowledge and a refined technique - and still seems excited about creating the vivid pieces that inhabit this album. In just a few seconds of this music one is transported to another plane. Bypassing verbal thought, connecting directly with the mind, his fluid lead melodies speak, as if in a voice, directly to the listener. Although closely associated with electronic sound, Wøllo uses guitar as the primary instrument in which to convey his message. Usually played through assorted effects, his lead lines are poignant, ethereal and elegant. The synthetic harmonies and melodies that fill out this majestic work are arranged with the skill of a seasoned composer. Gateway's more active pieces develop along a wonderful arc of crisp rhythms and layers of bounding sequencer patterns - which act to vivify the progression of Wøllo's tuneful lead lines flying above. When loosening structural plans, Wøllo also realizes compositions more in an ambient mode. Gentle and bittersweet, these beautiful slow moving sections possibly contain even more emotional content than the soaring hymns and exuberant fantasies found elsewhere on this CD. From stark simplicity to prog-influenced anthems Wøllo's spirit comes out in the precision and detail of his work - as it touches the best part of us.